Law Society of Scotland gets a new President, business as usual. JAMIE MILLAR, a partner with Edinburgh Law Firm Lindsays has taken over from Ian Smart as the new President of the Law Society of Scotland after what has been seen as one of the most problematic periods yet for the Scottish legal profession, who are facing everything from eventual regulatory reform to increased competition in the still-solicitor-monopolised legal services sector. While the Law Society of Scotland have been kind enough to publicise the change of presidency by focussing on the usual self congratulatory messages, what Drumsheugh Gardens chose not to reveal was regulatory record, or the amount of client complaints made against the law firm of Mr Millar. Lindsays bought up Borders law firm linked to Law Society-Penman scandal. Lindsays, who, on their website describe themselves as “ a highly-regarded Scottish law firm. We combine high levels of service with legal expertise to tailor the best possible outcomes and results for you, your business, or your family.” purchased a law firm based in Jedburgh, named Turnbull Simpson & Sturrock in early 2007 which were heavily involved in the maladministration of my late father’s estate by Borders solicitor Andrew Penman of Stormonth Darling Solicitors, Kelso, which used to be a partner firm to Turnbull Simpson & Sturrock until the Scotsman newspaper began reporting on the Law Society cover up of my complaint against Mr Penman. The Law Society’s Philip Yelland personally handled complaints against Penman & Sturrock. As the Scotsman continued to report on the Law Society’s whitewash of the complaints against Mr Penman, Turnbull Simpson & Sturrock’s senior partner, Mr David Sturrock took over the administration of my late father’s estate, only to make the actions of Mr Penman and the accountant/executor Norman Howitt (still working as an accountant at JRW Group) much worse, resulting in several more years of financial damage & negligence which was carefully swept under the carpet by the Law Society of Scotland in the true cover up style we have all come to expect from lawyers investigating themselves. Jamie Millar, a partner with Lindsays solicitors, has become the President of the Law Society of Scotland. Mr Millar (61) has been vice-president since May 2009, and was the Society’s Treasurer for three years before that. He has been a member of the Council for six years and served as a member of a Client relations Committee for seven years from 1997. A trainee with the then Tindal, Oatts and Rodger, Mr Millar qualified in 1973. He was a partner with the firm from 1975 to 1986. From 1986 to 2006 he was a partner at Bishops and from 2006 he was a partner at Brodies. Jamie has over thirty years experience as a corporate lawyer specialising in acquistions/mergers, joint ventures, trade associations and corporate governance. “The Legal Services Bill has been the major focus for the Society in the past year and will continue to be in the coming months as the Society looks at how it could regulate the new business models as well as supporting the profession during their introduction. “The Society is continuing its modernisation programme to meet the profession’s needs now and into the future, and with that the profession continue to be consulted and asked for feedback as we develop services which will support them during this challenging time. One of the key areas of work the Society is focusing on is the implementation of its review of education and training in 2010-2011. Law Society of Scotland voted to continue representing & regulating Scotland’s 10,000 solicitors. SOLICITORS in Scotland, even the ‘crooked ones’, can sleep safely at night once more, on the announcement the legal profession have voted in favour of the Law Society of Scotland retaining its representative role of lobbying for the interests of Scotland’s 10,000 solicitors over & above anyone else, while also maintaining its self-regulatory role, helping to preserve the legal profession’s control over consumer complaints against Scotland’s notoriously poor quality legal services market, where each year up to 5000 clients register complaints or dissatisfaction against their solicitors & law firms. 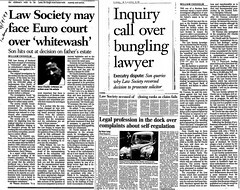 The unsurprising news came to light after the results of the Law Society’s latest ‘referendum’ were released, showing 73% of solicitors who voted, voted in favour of the Society maintaining its dual role of representing solicitors best interests, and investigating complaints against their colleagues. 4,138 solicitors (almost 40% of members) voted in the poll in which solicitors were asked to vote on a single question. ‘Should the Law Society of Scotland as statutory regulator continue to be responsible for promotion of the interests of, and the representation of, solicitors in Scotland?’ 3037 voted yes and 1101 voted no. Translated into plain language for the rest of us, Mr Smart’s statement would read : Solicitors have given the Law Society a green light to continue covering up client complaints, control the individual’s access to justice, and continue to lobby against any reforms which may threaten the legal profession’s dominance over legal services in Scotland. A legal insider condemned the whole referendum as a product of spin, accusing the Law Society of Scotland of engineering the vote to ensure it retained its power over regulation and the profession at large. Meanwhile a Scottish Government insider claimed that senior officials and Ministers at the Justice Department were happy to see the Law Society continue “as-is” because they felt it was easier to deal with the Law Society in its present form rather than what may emerge after its passing – which would account for the Scottish Government’s continual cave-ins (with more, as yet unannounced, to come) over the legal profession’s demands to water down the Legal Services Bill, which will end up about as much use as no use for widening the public’s access to justice in Scotland. The Scottish Legal Aid Board has often been the cash cow of the legal profession. LEGAL AID – Described by some as a state funded route to justice for those who cannot afford it, however, in reality something which has been grossly abused by many law firms & solicitors over the years who have neither represented the interests of their clients nor given those who cannot afford a solicitor an effective route to our courts, is unsurprisingly facing huge cuts in its budget as the recession looms large over the UK’s public finances. While talk of cuts to legal aid may seem an unimportant subject these days, since many law firms in Scotland claim to have given up legal aid work altogether, the threat of a few thousand pounds less in the pockets of solicitors is apparently still enough to galvanise the Law Society into its well worn call for unity among its members to ensure any cuts to the legal aid budget in Scotland are as minimal as possible. An official from a consumer organisation today claimed that with so many law firms across Scotland giving up legal aid work it was difficult enough for consumers to find a solicitor willing to take on a case with legal aid funding. 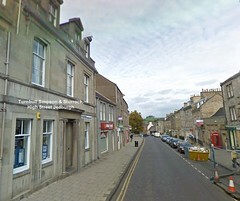 One client who reported his solicitor to the Law Society of Scotland for legal aid irregularities and is yet to hear back about his complaint said the legal aid system in Scotland was “poorly policed” and was little more than “a Law Society controlled public handout to bankroll solicitors who end up doing nothing for their clients”. Scottish solicitors have been urged to form a united front to fight a looming threat to legal aid budgets – because any cuts will have a hugely damaging effect on access to justice. New Westminster Justice Secretary Ken Clarke has indicated that the legal aid budget for England and Wales is in his sights when he looks to identify cuts – although it has been frozen for the last six years and the Coalition Agreement states that a "fundamental review" of Legal Aid is planned. In Scotland, while the legal aid system is not subject to Westminster control, it is certain to come under massive scrutiny, according to Andrew Alexander, the Law Society of Scotland’s Legal Aid co-ordinator. Mr Alexander said it was time to fight to protect both criminal and civil legal aid now – rather than waiting for cuts to happen. Civil legal aid in particular had already been “cut to the bone”, he added. The Legal Services Commission (LSC) delayed some payments to legal aid practitioners until April and its new financial year. Also, the LSC is now routinely delaying payments to solicitors, and the Law Society in England and Wales has needed to advise banks of the consequent cashflow problems for legal firms. The attempt to drive down costs at the LSC has led to tendering proposals for criminal work that would see around 500 firms receive contracts for criminal work in England and Wales: the remainder of the 1,700 criminal firms south of the border would, from 2011, leave the market." “Whether these tendering proposals go ahead under the new Government, it is clear that cuts to the Legal Aid system in England and Wales are likely to be severe,” said Mr Alexander. “In Scotland, the Law Society will strongly defend the interests of solicitors in criminal and civil Legal Aid practice, just as these practitioners strongly defend some of the most vulnerable in society at the most vulnerable stages of their lives. “It is vital that the profession is united in facing this challenge: not just Legal Aid practitioners but also solicitors working at Law Centres and at voluntary organisations, bodies which rely on public funds to provide assistance to the public. Mr Alexander said reforms to speed up justice and reduce costs had to continue: the Society's criminal negotiating team had substantial input to the summary justice reform process, and are now active in monitoring and evaluating its progress. He stressed that these recent reforms had delivered bigger savings than predicted and that work would go on to encourage early pleas to save money and time. The Law Society of Scotland has recently met with Lord Bach, former Legal Aid Minister for England and Wales; with Helen Edwards, current Director General at the Ministry of Justice in London; with its counterparts at the Law Society of England and Wales; and will shortly be visited by Ministry of Justice officials from New Zealand. In fighting for access to justice in Scotland, learning lessons from other jurisdictions will be vital. "Legal Aid was intended as the fourth pillar of the welfare state," Mr Alexander concludes. "It remains vitally important that people who are unable to afford representation have that paid by the state. This is a concept that is intuitive – 68% of people in a recent YouGov survey agreed with this principle – and one which the Society will strive to maintain." Scotland’s Lord President Lord Hamilton. The rules governing the use of McKenzie Friends in Scotland’s courts, which are set to come into force by the end of June of this year, have finally been published on the Office of Public Sector Information website, confirming that for the first time in Scotland, some four decades after McKenzie Friends came into existence in the now famous English court case McKenzie v McKenzie (1970), the internationally acclaimed non-lawyer courtroom helper will finally be available to unrepresented party litigants in Scottish civil courts. However, while the Act of Sederunt, signed last Tuesday by the Lord President will finally allow McKenzie Friends to be used in Scotland, the terms of the Lord President’s language in the guidance have confirmed the fears of many that the usage of the internationally acclaimed non-lawyer courtroom helper will be subject to strict conditions & restrictions in Scottish courts, apparently after demands from representatives of the Law Society of Scotland & Faculty of Advocates to limit the spread & availability of McKenzie Friends in civil law cases. Scotland’s legal establishment are thought to have intervened against the full implementation of McKenzie Friends out of fear that law firms would lose business to the much cheaper, and sometimes free non-lawyer McKenzie Friend, or as the Lord President prefers to use in Scotland a “Lay Assistant”, after Lord Hamilton claimed Scots were too ignorant to understand the meaning of the term “McKenzie Friend”. It has emerged from the published guidance the Lord President intends to forbid McKenzie Friends in Scotland from receiving any payment for their service, this despite the fact that case law exists in England & Wales, allowing a McKenzie Friend to receive remuneration for their services. This issue had come in for severe criticism by campaigners, consumer organisations, experienced McKenzie Friends from English courts, and even MSPs at the Scottish Parliament, where recently, the SNP’s MSP Nigel Don (North East Scotland) criticised Lord Hamilton’s protectionist block on McKenzie Friends receiving payment for their services. During the same Petitions Committee hearing, another thorny issue arose, over the Lord President’s apparent hostility to using the term “McKenzie Friend” in Scottish Courts, which has resulted in Lord Hamilton’s published rules using the term “Lay Assistant” instead of “McKenzie Friend”. A third, even more restrictive condition has also made its way to the published Act of Sederunt which has already resulted in significant criticism from consumer groups, that of requiring a potential McKenzie Friend, or “Lay Assistant” to sign a certificate and give details about themselves which are generally not required in most other jurisdictions where McKenzie Friends operate. (iii) questions which the litigant might wish to ask witnesses. (2) It is a condition of such permission that the named individual does not receive from the litigant, whether directly or indirectly, any remuneration for his or her assistance. (b) it is of the opinion that it would be contrary to the efficient administration of justice to grant it. (4) An application under paragraph (1) is to be made by motion and accompanied by a document, signed by the litigant and the named individual, in Form 12.A-A. (5) Permission granted under paragraph (1) endures until the proceedings finish or it is withdrawn under paragraph (6); but it is not effective during any period when the litigant is represented. (6) The court may, of its own accord or on the motion of a party to the proceedings, withdraw permission granted under paragraph (1); but it must first be of the opinion that it would be contrary to the efficient administration of justice for the permission to continue. (b) impart to the named individual any information, which is in his or her possession in connection with the proceedings without being taken to contravene any prohibition or restriction on the disclosure of the document or the information; but the named individual is then to be taken to be subject to any such prohibition or restriction as if he or she were the litigant. (8) Any expenses incurred by the litigant as a result of the support of an individual under paragraph (1) are not recoverable expenses in the proceedings.”. Those wishing to apply to the court to assist a party litigant as a McKenzie Friend in Scotland must also declare whether they are related or not to the litigant, or whether they have a financial interest in the outcome of the case, also confirming they are not receiving remuneration from the litigant, directly or indirectly, for their assistance and will not receive any such remuneration. Additionally, they must accept that documents and information are provided to them by the litigant on a confidential basis and undertake to keep them confidential. It was indicated today Lord Hamilton’s Act of Sederunt will not be the final word on bringing McKenzie Friends to Scotland, as the Petitions Committee have indicated they will look again at the issue later in the year, and there are still plans by the Scottish Government to bring an Amendment to their beleaguered Legal Services Bill at its Stage Two hearing at the Scottish Parliament. Scottish Legal Complaints Commission censored documents to protect top judge’s husband’s anti-public insults. CONTINUING REVELATIONS OF AN ANTI-CLIENT POLICY at Scotland’s legal complaints regulator – the Scottish Legal Complaints Commission have led to the SLCC demanding key documents revealing a series of insults against Scots consumers made by one of its lawyer board members David Smith, the husband of Court of Session judge Lady Smith, be withheld from release in an investigation currently being carried out by Scotland’s Freedom of Information Commissioner, Kevin Dunion. Scotland’s Information Commissioner Kevin Dunion. 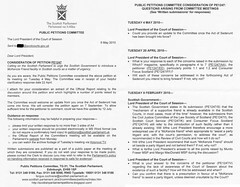 FOI Commissioner Kevin Dunion was asked to investigate the Scottish Legal Complaints Commission over a Freedom of Information response which contained heavily blacked out, yet readable details of insults & tirades by the SLCC’s board members against consumers, individuals, and solicitors clients who had been invited by the Commission to take part in the first ever external investigation into the infamously corrupt Master Insurance Policy & Guarantee Fund, operated by the Law Society of Scotland & Insurers Marsh & Royal Sun Alliance, the purpose of which is to compensate victims of ‘crooked lawyers’ but which in reality rarely ever pays out to consumers. The Scottish Legal Complaints Commission’s findings in their report on the Master Insurance Policy, carried out by the University of Manchester Law School, revealed as I reported earlier : Suicides, illness, broken families and ruined clients reveal true cost of Law Society's Master Policy which 'allows solicitors to sleep at night'. The investigation by Mr Dunion, which has yet to reach a conclusion, has revealed significant amounts of documents released by the SLCC were so poorly censored that personal details of individuals, identifiable home addresses & contact information, all of which is firmly contrary to the practices of the Freedom of Information Act were easily readable to those in receipt of the documentation. SLCC Board member David Smith branded consumers as “Frequent flyers”. 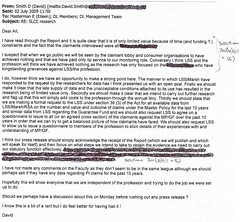 In one example document, Mr Smith, a lawyer member of the SLCC’s board, who formerly served with Edinburgh legal firm Shepherd & Wedderburn, said in censored but readable emails to the SLCC's now former Chief Executive Eileen Masterman, who resigned recently on grounds of ‘ill health’ : "I have read through the Report and it is quite clear that it is of only limited value because of time (and funding ?) constraints and the fact that the claimants interviewed were all frequent flyers." Mr Smith went onto repeat the insults further, stating : "I suspect that when we go public we will be seen by the claimant lobby and consumer organisations to have achieved nothing and that we have paid only lip service to our monitoring role. Conversely I think LSS and the profession will think we have achieved nothing as the research has only focussed on the frequent flyers who have longstanding grievances against LSS/the profession." Realising the significant public humiliation of being revealed as an anti-consumer quango which appears more pro-lawyer than pro-client, the Scottish Legal Complaints Commission have made new demands to the FOI Commissioner’s office that it be allowed to extend the initial exemptions used to conceal the bitter insults by its own board members against the public under at least five more categories (sections 30(b)(ii), 30(c), 33(1)(b), 36(2) and 39(1) of FOISA), in an attempt to thwart any public backlash against its increasingly pro-lawyer policies which have ensured not one successful complaint outcome for a member of the public against a rogue lawyer, since the SLCC took up its remit ion 1 October 2008 at an accumulated cost to both the taxpayer & legal profession of well over £6.5 million. A legal insider said today the SLCC ‘were desperate’ to prevent the censored information from becoming public knowledge, despite the fact the redactions undertaken by the SLCC could be read by all. “It appears the Scottish Legal Complaints Commission from the top down, hate the publoc. An organisation with such an overtly hostile approach to consumers does not deserve to command any confidence, respect or trust from members of the public." He continued : "If, as seems to be the case from the FOI documents the SLCC’s board members feel so embittered against consumers who are in many cases, forced through the most appalling circumstances to approach the Commission for an investigation into a solicitor, these board members should hand over their regulatory duties to someone of a more balanced and less partisan approach." So far the Scottish Legal Complaints Commission have made no official comment on the ongoing investigation into the badly redacted documents, however one member of the public who was identified, along with his address within some of the released papers which contained details of communications with the Scottish Government’s Finance Chief Mr John Swinney, said he would pursue the matter further, as the Commission had been negligent in their duty to handle FOI material in a responsible manner. The Freedom of Information Commissioner’s office is yet to make a ruling on this latest case involving the Scottish Legal Complaints Commission. Scotland’s Lord President passes McKenzie Friends hurdle. Confirming my report earlier in February of this year on the Lord President, Lord Hamilton’s plans to formally introduce McKenzie Friends to Scotland’s courts, it has been announced the Court of Session Rules Council, the body which oversees rules regarding any matters which the Court could regulate by an ‘Act of Sederunt’, has discussed the issue of McKenzie Friends at its Monday meeting of earlier this week, and is now in the process of drawing up the rules which will allow & govern the use of McKenzie Friends in the Court of Session by the end of June 2010. While the Lord President's Office had no further comment to add to this statement, campaigners & consumer organisations expressed their hope the rules to be drawn up for Scots McKenzie Friends will mirror that of the guidance used in the English courts system, and not prove as restrictive as the Lord President’s initial proposals announced in February, which were criticised by consumer groups as being too strict. An official with one of Scotland’s consumer organisations said : “I am delighted Scottish consumers will shortly have the invaluable assistance a McKenzie Friend can provide in court for those who cannot obtain or afford legal representation." Scottish Parliament asked Lord President ‘to keep them updated on McKenzie Friend law. Questions which were raised late last week over the Scottish Parliament’s Petitions Committee’s recent letter to the Lord President have now also been resolved with the release of documents from the Parliament, confirming the Committee had asked the Lord President for “an update once the Act of Sederunt has come into force”, rather than choosing to raise specific key points which came out of last Tuesday’s meeting of the Petitions Committee, namely those of remuneration of a McKenzie Friend, usage of the term “McKenzie Friend” and the involvement, or interest of a McKenzie Friend in the case in which they are assisting. The Petitions Committee indicated they would next consider the McKenzie Friend petition on 7 September 2010. The Court of Session Rules Council, who are now drafting the rules on McKenzie Friends, consists of the Lord President ex officio, two other judges of the Court of Session appointed by the Lord President, five members of the Faculty of Advocates appointed by the Faculty and five solicitors appointed by the Council of the Law Society of Scotland. Members hold office for three years and are eligible for reappointment provided that they retain the qualifications for membership. It should be noted the Faculty of Advocates & the Law Society of Scotland in written submissions to the Scottish Parliament both opposed the introduction of McKenzie Friends to Scotland’s Civil courts. You can read my coverage of the Faculty of Advocate's objections HERE and the Law Society of Scotland’s objections HERE. However, despite both the major power blocks of the Scottish legal profession obstructing & opposing the introduction of McKenzie Friends to Scottish Civil courts, the issue seems to have cleared the Court of Session’s Rules Council, and we now have an apparent success which should benefit all Scots who require access to justice and our courts. The draft rules are expected to be available soon, and will be published as I receive them. Holyrood Committee’s exchanges with Lord President questioned. QUESTIONS have been raised over the outcome of Tuesday’s Petitions Committee hearing on Petition 1247 (McKenzie Friends for Scotland) after it emerged late yesterday that while two members of the Petitions Committee had raised important points to be clarified with Scotland’s Lord President, Lord Hamilton, over the proposed Act of Sederunt to allow McKenzie Friends in Scottish courts, the actual letter sent from the Petitions Committee to the Lord President simply stated "Could you provide an update to the Committee once the Act of Sederunt has been brought into force". This latest extraordinary turn of events in the campaign to bring McKenzie Friends to Scotland’s courts, a non-lawyer courtroom helper which unrepresented party litigants have been successfully using in England & Wales for the past forty years, comes after last Tuesday’s Petitions Committee hearing concluded its latest deliberations on the McKenzie Friends petition by stating on the Scottish Parliament’s Petition 1247 web page : “4 May 2010 : The Committee agreed to write to the Lord President of the Court of Session seeking a response to specific points.” after two of the Petitions Committee members, MSPs Nanette Milne & Nigel Don raised the thorny issues of the usage of the term “McKenzie Friend” and the question of whether a McKenzie Friend could be remunerated for their services – both key points the Lord President has proved highly resistant to discuss or implement. Nigel Don MSP (SNP) Nigel Don, member of the Petitions Committee & Parliamentary aide to Justice Secretary Kenny MacAskill raised two significant points the Lord President had failed to resolve over the year long battle to bring McKenzie Friends to Scotland’s courts. Mr Don initially praised Lord Hamilton “for getting on with things”, going onto firstly tackle the question of a ‘certificate’ which Lord Hamilton initially proposed should be required for all potential McKenzie Friends to sign prior to their acceptance by the court – a move heavily criticised by politicians, law reform campaigners and even several consumer bodies including Which? & Consumer Focus Scotland. Nigel Don said : “I am probably not the only one who feels slightly confused about where we have got to. The issue seems to be moving so fast that I am not sure on which side of the net the ball has ended up. However, we should commend the Lord President for getting on with things and for explaining, in his most recent letter, some points that we did not get round to discussing during our previous meeting due to shortness of time. “I want to raise two points about the suggested rules in the Lord President's letter of 19 February, which predates our previous meeting. Paragraph 5 of that letter states: "The certificate should ... confirm that the lay assistant has no interest in the case". Mr Don went onto raise the equally thorny issue of whether a McKenzie Friend can be paid for their services, an issue I reported on in mid-April, revealing actual case law from the English Family Courts division, which supports a McKenzie Friend’s entitlement to charge for their services. Nigel Don at the April hearing appeared to support the Lord President’s resolute position that no McKenzie Friends should receive money for their services, however Mr Don now appears to have changed his position substantially. Nigel Don continued : “Secondly, the Lord President's letter of 19 February states immediately thereafter that the McKenzie friend—or lay assistant, as we should perhaps now describe him—is "to receive no remuneration for his or her services in any form". Scotland’s Lord President, Lord Hamilton. Lord Hamilton’s hostility against using the term “McKenzie Friend” – which is accepted in most international jurisdictions where the McKenzie Friend is used, has left many involved in the Scottish debate on McKenzie Friends questioning why the Lord President apparently feels even after forty years, that Scotland should, not join the rest of the world in allowing what is a uniquely named and internationally recognised courtroom helper to assist the growing numbers of unrepresented court users in Scotland who find themselves unable to obtain legal representation. Which? 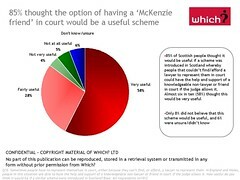 reported that 85% of Scots would like to see McKenzie Friends allowed in our courts. In an earlier report on the McKenzie Friend petition, I revealed the Lord President had put forward several reasons to the Petitions Committee why he felt the term “McKenzie Friend” should be swapped with the term “Lay Assistant”, where Lord Hamilton alleged Scots were too ignorant to know what a McKenzie Friend actually is, this despite research & polls taken by consumer organisations such as Which? who reported that 85% of those questioned during recent research carried out by Which? on Scottish Legal Services thought it would be a good idea to allow McKenzie Friends in Scotland’s courts. Replying to the Convener, Nigel Don said he was against deferring the planned enacting of the Act of Sederunt at Monday’s Court of Session’s Rules Council meeting. The Committee agreed to continue Petition 1247, and write to the Lord President on the issues raised during the hearing, however as revealed by Holyrood insiders late yesterday, the Committee had apparently changed their mind and simply asked Lord Hamilton to update them once the Act of Sederunt has been brought into force, leaving many questions over whether the Lord President had amended any of his ‘overly protective’ plans announced in February, which have formed the bunk of debate & criticism since being proposed by Lord Hamilton as a way forward. No one from the Scottish Parliament was available for official comment late yesterday, nor were enquiries acknowledged on exactly what the Committee had asked of the Lord President after their meeting last week. Labels: Consumer Focus Scotland, Court of Session Rules Council, Lord Hamilton, McKenzie Friend, Nanette Milne, Nigel Don, Petition 1247, Scottish Parliament, Which? UK Election 2010 : Vote, because you should ! 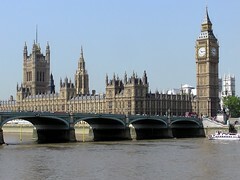 The Palace of Westminster – It’s our Parliament too ! Over the past few weeks of the UK’s election campaign, I’ve noticed many readers saying in comments & emails ‘its just not worth voting'. Never could I disagree with a statement more than this. As citizens, British subjects, the electorate, the one thing we have to hold our politicians to account, to maintain or change the way we are governed, and help decide our nation’s future, is the ballot box. Use the opportunity we have today, participate, and vote ! Some politicians say they are giving us an invitation to join the Government. Well, if that is the case, use your vote, and power as a citizen to ‘join’ such a Government, and hold them to account on each & every issue, policy or law they propose, address or change, along with the very way they may govern us if elected. Some politicians say we, the people, are the boss. This is the way it should be. If you feel this way, use your vote and power as a citizen to ensure they continue to do their best for the country, and you, through the good times and the bad. Some politicians say we need a change in British politics, that it should be cleaned up once & for all, and that the very nature of how we vote should be changed to allow ‘wider representation’ of the population. If you feel that way, then again, use your vote and power as a citizen to bring such change, and never let up until such change is upon us. Some politicians say we need a local champion fighting for Scots at Westminster. We certainly do. All the candidates in Scotland, for whichever political party they are standing for, are very much local champions in their own constituencies. If you feel we need those local champions, find yours, and vote for them ! Lets face it, you can be rest assured the professions will be voting in their numbers, to ensure, or help along the party they wish to be in power … so we as individuals should also use our vote, to make our voice heard. So, to my readers today … certainly to those of you who may have given up on the political process – take a few minutes out of your day, go along and vote for whichever candidate, local champion, or political party you feel will do their best for the nation, you, your family, your finances, your wellbeing, the causes you may campaign on, or the injustice you may fight, personal or otherwise. We cant grumble if we don't participate, so participate ! Scottish Parliament debated Legal Services Bill. THE LEGAL SERVICES BILL for Scotland, proposed by the Scottish Government to improve Scots consumers access to justice “is turning into little more than a legislative time wasting exercise controlled by the legal profession” according to consumer sources today, after the developments of the past week which saw the bill debated at the Scottish Parliament last Wednesday 28 April where the Bill was passed by 98 votes to 2, amid many retractions by Scottish Ministers on key parts of the bill after intervention by the Law Society of Scotland. Last Wednesday’s tedious & winding debate, which left spectators in little doubt this piece of access to justice legislation was developing into ‘little more than a protection racket for the current legal services monopoly held by solicitors in Scotland’, saw many retractions of the proposals aimed at allowing Scots consumers to make their own choice on where they could purchase legal services, such as from independent non-lawyer owned legal providers, as opposed to the current Law Society controlled monopoly on legal advice. The Holyrood debate was then followed by a remarkably staged piece of theatre two days later on Friday, where the Law Society of Scotland’s Council, who purported to be previously in favour of alternative business structures voted to oppose abs allowing non-lawyers majority ownership of existing law firms. Two days after the Holyrood debate took place, an already planned policy change was voted through by the Law Society of Scotland’s ‘Council’, which changed its policy on alternative business structures (ABSs) to support majority ownership (51%) of law firms remaining with solicitors or solicitors with other ‘regulated’ (preferably self regulated, of course) professionals. More changes are planned, on the Law Society’s stance on the Legal Services Bill itself, as well as a slew of amendments the Society has persuaded (forced) the Scottish Government to undertake to the bill during it’s next hearings at the Scottish Parliament’s Justice Committee. “Making detailed amendments” …. that will of course relate to ensuring solicitors control the legal services market in Scotland, and ensure any ‘consumer choice’ is killed off at birth .. and with the Scottish Parliament & Scottish Government apparently so willing to bend to the Law Society at every stage, consumers shouldn’t expect much from this fatally damaged piece of legislation. There is little doubt now the Legal Services Bill will end up as badly damaged as the Legal Profession & Legal Aid (Scotland) Act 2007, and will do nothing for Scots consumers, in terms of widening choice of legal services & access to justice. Background : The Legal Services Bill (Scotland) came into being after the consumer organisation Which? issued a “super complaint” to the Office of Fair Trading under section 11 of the Enterprise Act 2002, stating that the consumer interest was being harmed the restrictions on advocates' business structures, solicitors and advocates providing services jointly, third party entry into the market, and direct consumer access to advocates. Labels: Consumer Focus Scotland, Fergus Ewing, Ian Smart, Kenny Macaskill, Law Society of Scotland, Legal Services Bill, OFT, Scottish Government, Scottish Parliament, Tesco Law, Which?